Trip Log – Day 278 – Durham NC to Raleigh NC | How Will We Live Tomorrow? Our political and economic system is full of policies established with good intent that, over time, become tools that reinforce power and status quo. Consider zoning. Before the industrial revolution, the idea that work, commerce, and living were separate activities didn’t exist. Zoning was a noble idea to reduce urban density, bring light and air to dwellings, and separate people’s homes from noxious industry. Early zoning codes were a key element of the dramatic increase in public health we witnessed a century ago. However, by the time Charles Erwin Wilson, Eisenhower’s Defense Secretary, announced, “What is good for GM is good for the country,” zoning had become a tool to reinforce economic stratification and promote an automobile-based economy. Compartmentalizing our lives became the norm. Daily transportation, most often by private car, became the link between segregated activities; a link that can consume an hour or more each way from home to office. Today I pedaled through Research Triangle Park, perhaps the world’s largest parcel of single use zoning. RTP’s 7,000 acres contain nothing but wide roads connecting over 200 corporate office buildings and parking lots hidden behind trees, trees, and more trees. 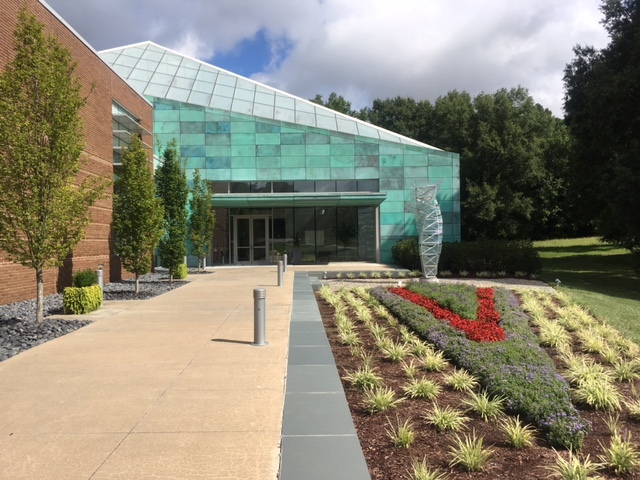 RTP started in 1959 to create business and research opportunities tied to the area’s three main universities: Duke, UNC, and NC State. It became famous during the 1960’s, when segregating our environment and promoting car travel was king. RTP gained cache when IBM transferred a large part of their operations there, though if you are true David Sedaris fan, you know his spin on a North Carolina youth with an IBM dad is not all perfection. At ten a.m. on a weekday morning, I encountered little traffic and no sign of the 50,000 people who work here. After driving a minimum of ten miles to their offices, they were snug indoors. I don’t buy the idea that great ideas take place in a pastoral environment. Innovation comes from constant contact with problems, not in escaping them. The technology start up I visited yesterday is in bustling downtown Durham. Corporations at Research Triangle Park are big guns, long past nimble. 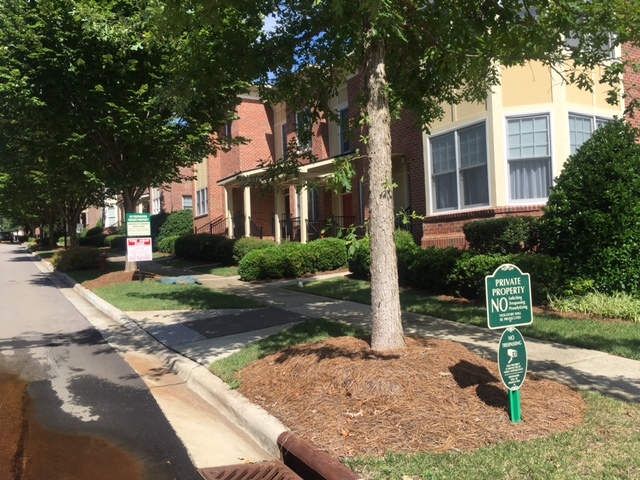 Perhaps the best thing that can be said of sixty years of ultra-low density, monoculture development is that there is plenty of room in RTP for infill. They recently carved out 100 acres, a pittance, to create ‘Center Park’, a new urbanism collection of upscale houses and stores. The first effort at a finer scale of zoning, to create a place rather then simply space. It isn’t much, but it’s a start. This entry was posted in Bicycle Trip Log and tagged Durham NC, Raleigh NC, Research Triangle Park. Bookmark the permalink. 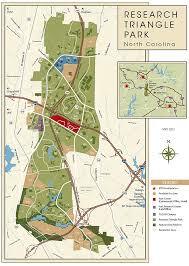 Interesting commentary on research triangle. I’m in tech and don’t know much about it but had perceptions like what you describe. I work at Honeywell now and they want to increase the amount of software in the company’s product mix. 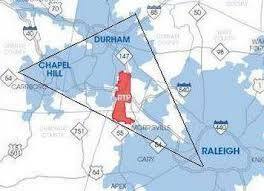 I heard an executive suggesting research triangle would be a good place which seemed off when I heard it. 128 belt in suburban Boston is struggling to compete with the software tech growth in the more urban areas of the Boston area.